My last summer seasonal ridge runner weekend was over the October 14th weekend. It ended up that I just went out on the Sunday for the day. I met up with my buddy Ray from our Connecticut AMC chapter. 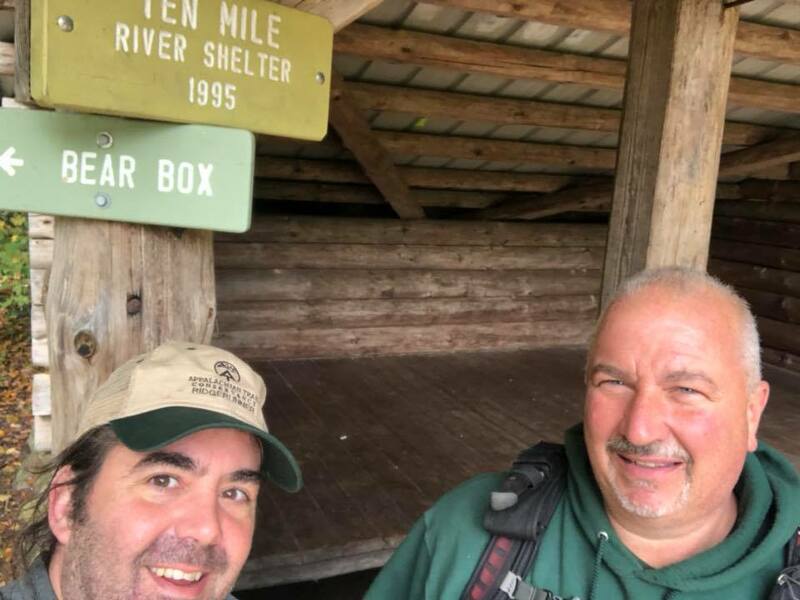 We walked down to the Ten Mile River shelter and campsites from the Bulls Bridge trailhead and found plenty of issues. Both bear boxes were left open, one filled with bags of food trash. At the shelter was left a whole onion, and a cast iron pot which was clearly used to cook in the night before. All of these things are an open invitation to wildlife, even in daylight. This then becomes a danger for humans, and a danger for the wildlife. It is known that a boy scout troop was there the night before. I’d just like to reiterate that as scouts you and especially your leaders are responsible for following and teaching leave no trace. Had I had the chance to encounter them I would have gone through this in person but please, we all must follow these rules. 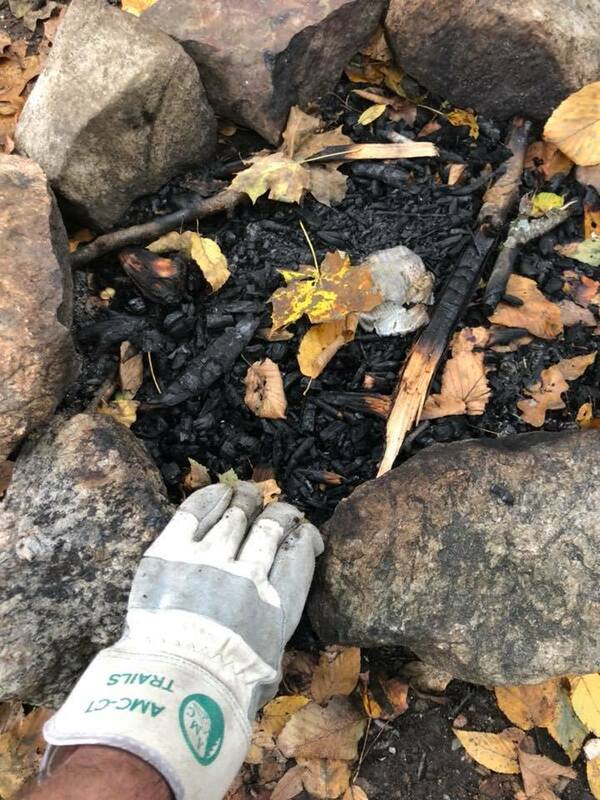 I also found 2 fire pits behind the shelter, with beer cans and tinfoil. Ray packed out the trash and iron pot while I continued my walk up to Ten Mile Summit and the Housatonic Overlook. And I cleaned up the firepits on the way back and checked the privies for issues. 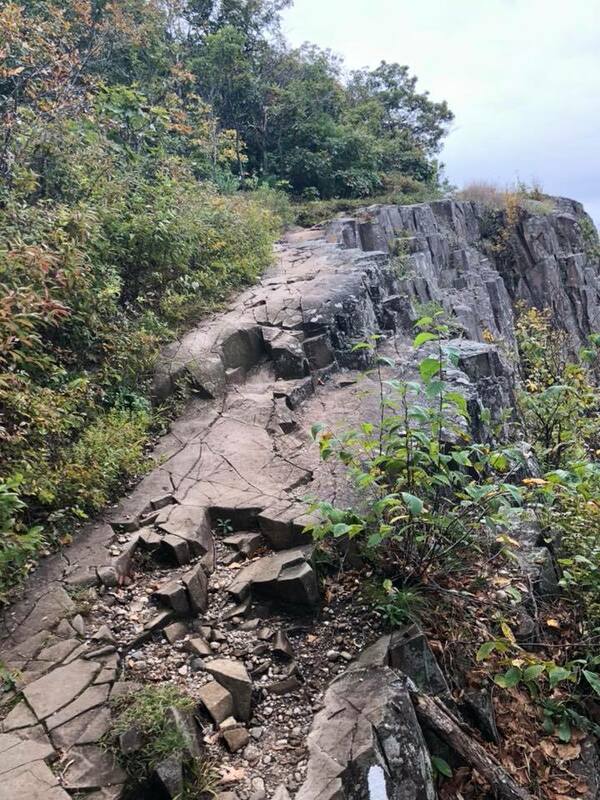 The more people break the rules and risk the delicate agreement between private landowners along the trail perimeter, the more the very trail is put at risk. Please follow the rules. As a former scout, it breaks my heart to think there might be leaders out there willingly breaking leave no trace rules but also teaching scouts that this is acceptable behavior. It’s not. Enjoy nature. Take only pictures, leave only footprints. Last weekend we were in the Berkshires to celebrate Fielden Stream’s birthday with friends at their lake house. While the girls were off enjoying a Yoga and meditation retreat, I headed for the mountains once again. The goal this time was to check out the Mount Tom State Reservation for the first time. In the process, I could also contribute towards my miles for the #Hike50Net challenge. 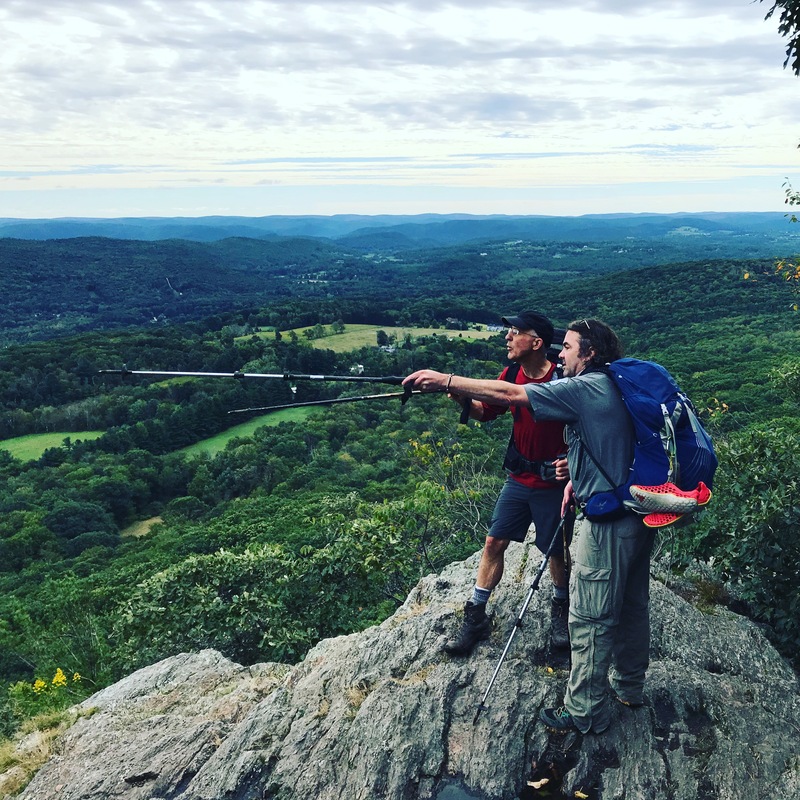 This is the challenge to accumulate 50 points in the calendar year on the New England National Scenic Trail by a combination of hiked miles, sharing images, writing Hike-u’s and volunteering. 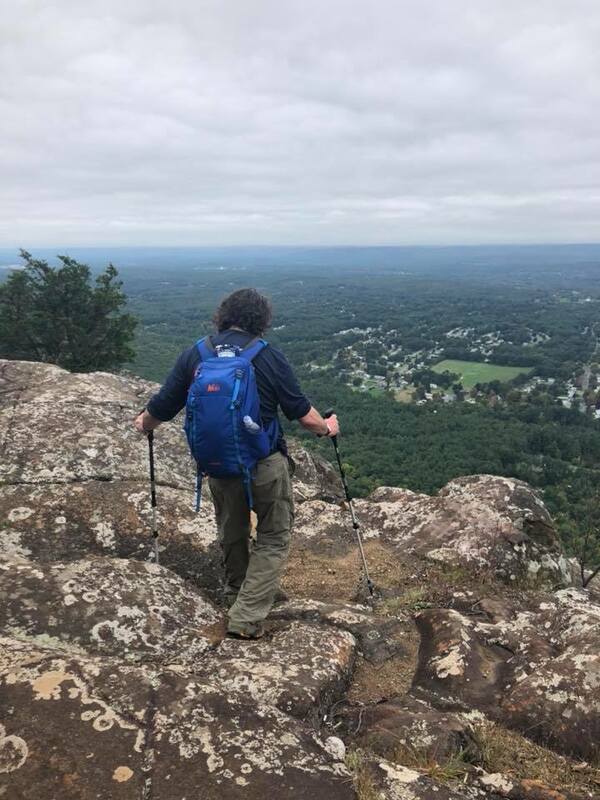 As you may remember I brought my brother out on part of the Mattabessett trail section in Connecticut earlier this summer. 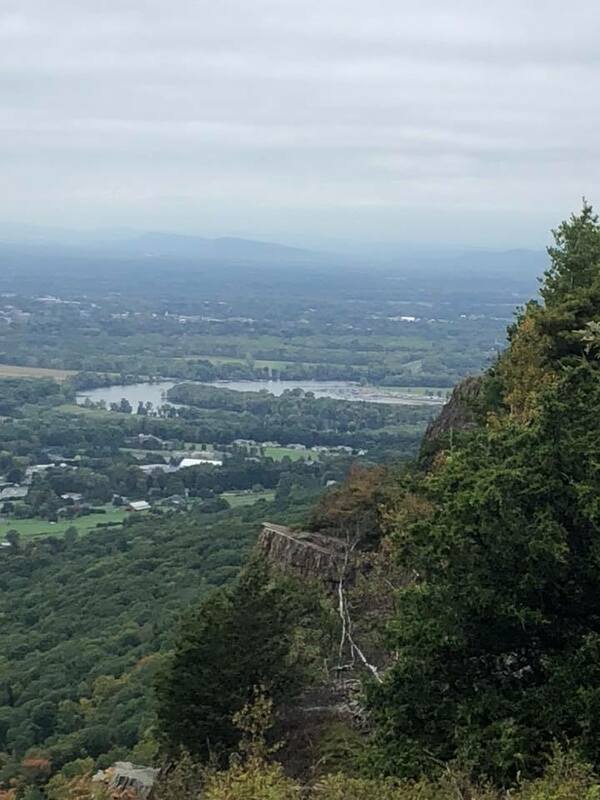 Here in Massachusetts the N.E.T is comprised of the Metacomet and Manondnock trails, stretching from the Massachusetts state line to its finale atop Mt. Manodnock on the New Hampshire border. As I didn’t have anyone along with me or a shuttle arranged, i did an out-and-back from the south side of the park, so I will have to go back another time and do the same from the north end to complete the section sometime in the future. No problem. Not only should it be an easy one to convince someone to come along on just for the views, but its no more than five miles out and back from the north end so not too bad mileage-wise either. There seems to have been some re-routing off the road which wasn’t on my map, but to make sure I was sticking on the route in my tracker, I did the .4 road walk at the beginning and end. I see now why it was re-routed, but it was also much further into the woods in that area, and I had limited time. It was a very steep climb up from the base of Mt. Tom to the summit, over a mile of loose, basalt scree. Basalt is the red volcanic rock prevalent along this trail’s ridgelines. It was slow going both up and down the big climb for this reason. I realize it probably helps prevent erosion, but it felt like being on roller skates sometimes. There were not many switchbacks to ease the ascent, but fortunately it was only about 7-800ft tops. Once at the summit of Mt. Tom, there were many hikers enjoying the long views in all directions. 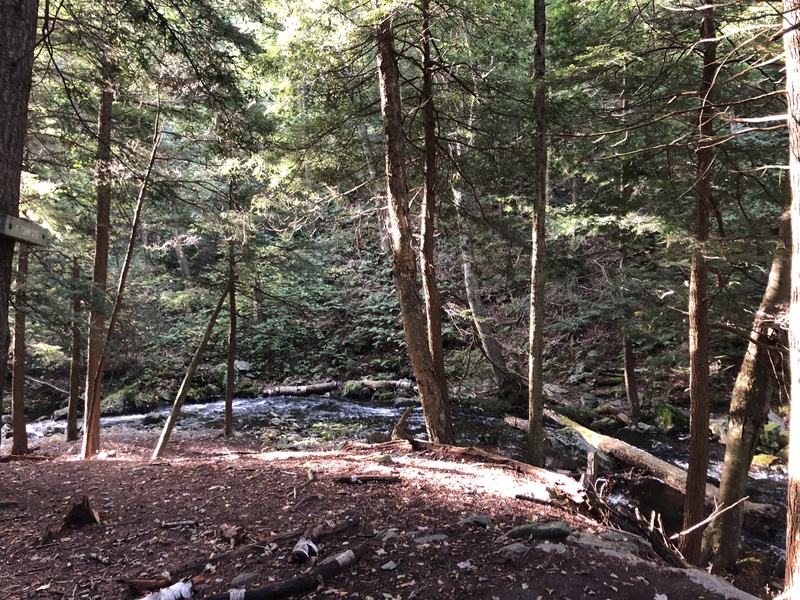 This used to be a ski area when I was a kid and I remember seeing its trails lit up for night skiing whenever we would pass it on 91 north on our way to Vermont. There are a bunch of large radio towers up there as well as old foundations for the ski lifts and infrastructure. I don’t know if there are any old ski buildings left on the other side. I believe they have a winter park there for tubing and such, so they may have left the lodge. The NET follows the western ridge so this was the steep side with no trails. There are trails that go along the front and I imagine there are traces left of the ski trails. At some point I will do those as I would be interested to see that. I never did ski there, which is a shame. For the entire ridge line, the trail hugs the cliff edges, with the occasional dip back into the woods here and there. 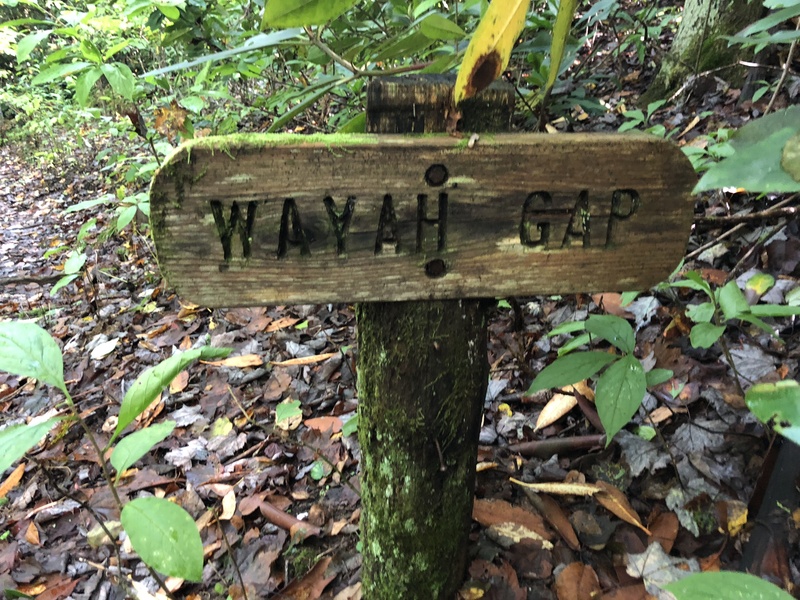 But this was not to ease an ascent or descent – there were plenty of those along the steep ledges. This is similar to the sections in Connecticut as well, so it was not new for me by any means. 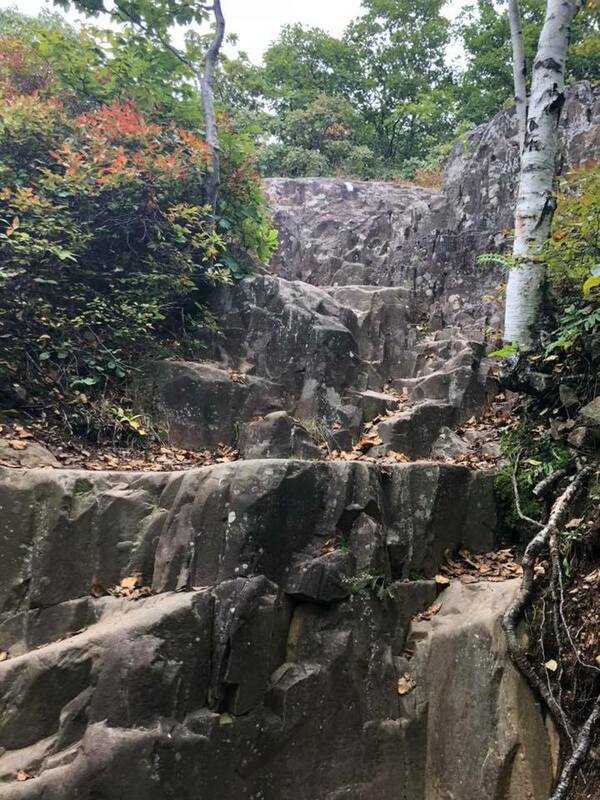 These trails are where I cut my teeth and faced my fears in preparation for similar terrain on the Appalachian Trail. The basalt however is looser and broken in many places, making it all the more important to take your time. 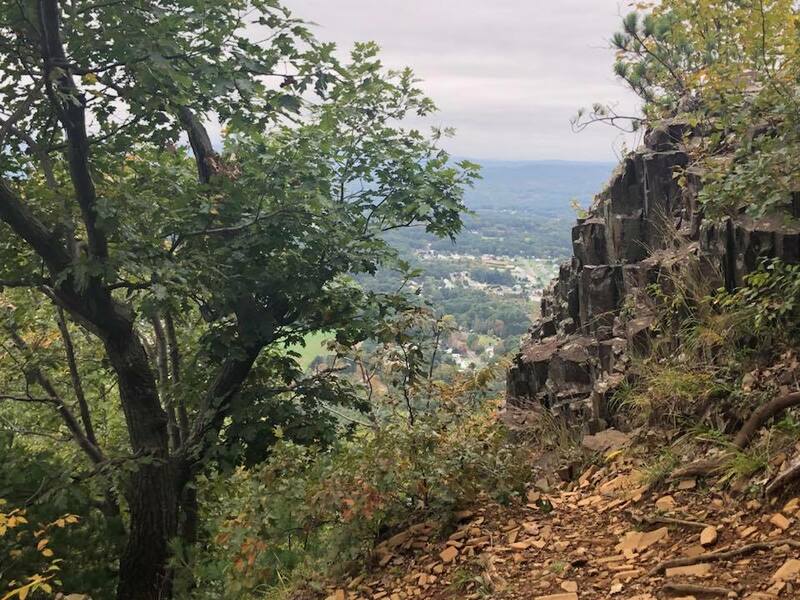 It was encouraging to me to realize that over the miles of cliff walks I needed to do on this hike, I have come a long way in facing my fear of such things, and it made me feel strong and confident. I hiked over three peaks and back: Mt. Tom, Deadtopp, and Whiting Peak. Next time I will conquer the remaining three in the range from the northern end. 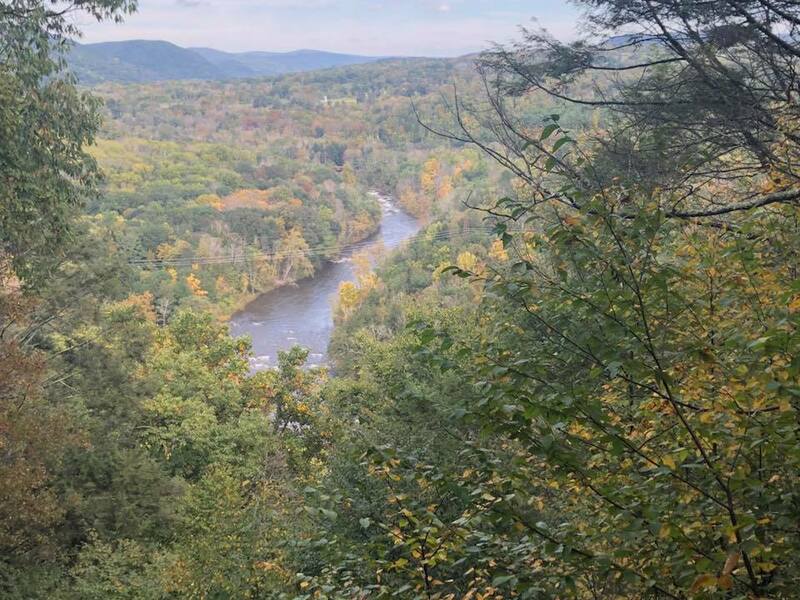 Another highlight was I was able to view the Oxbow in the famous Thomas Cole painting from the ledges. That painting was actually made from the ledges of nearby Mount Holyoke in Northampton, however. You can see it in the last photo. 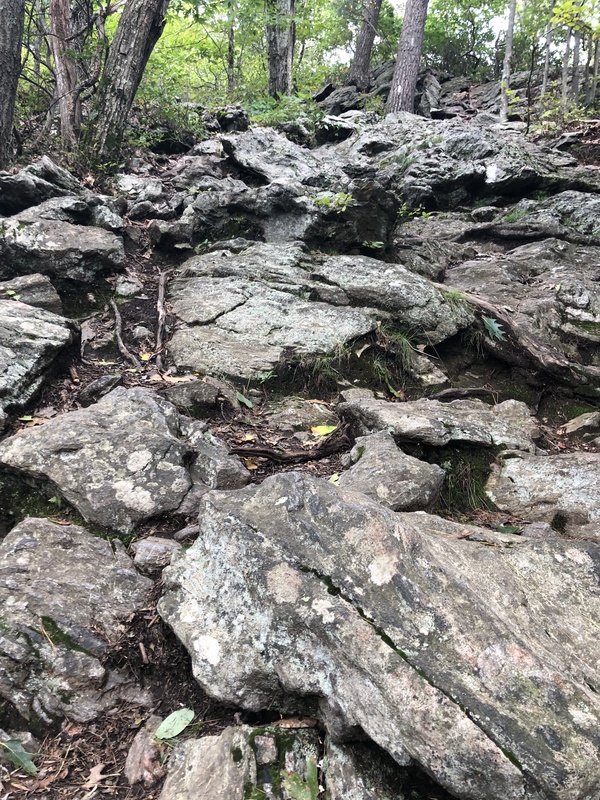 Not to be confused with Siler’s Bald, farther north in Great Smoky Mountain National Park, this is one of the southern balds along the Appalachian Trail in North Carolina. I believe they are both named after the same family. And both have tremendous views. We were in the Northeast corner of Georgia over the last weekend of September to visit Jiffy Pop at his school just east in northwestern South Carolina. The North Carolina border is also just about 15 miles from where we were staying in Clayton, so of course we had to go do a hike. 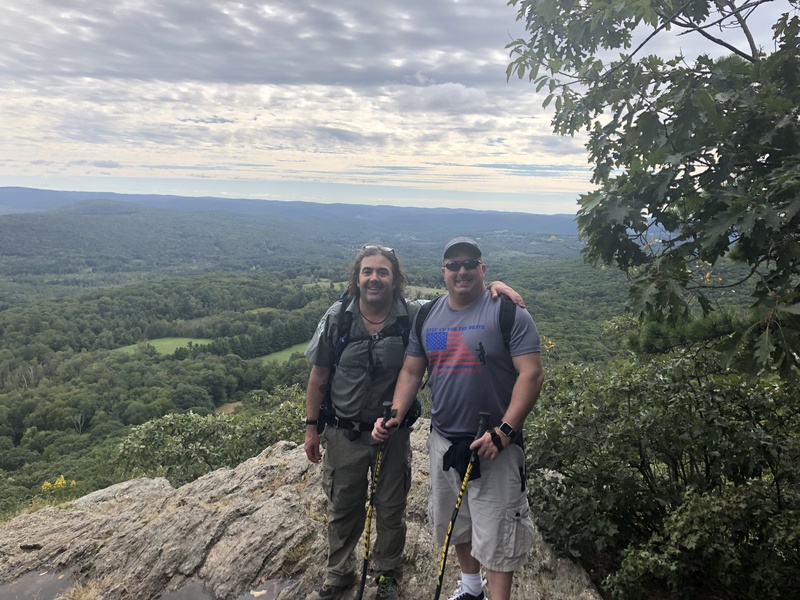 We haven’t had a chance to hike with Jiffy Pop in quite some time, and we’ve never hiked the A.T. south of Shenandoah National Park in Virginia, so this was a big treat. 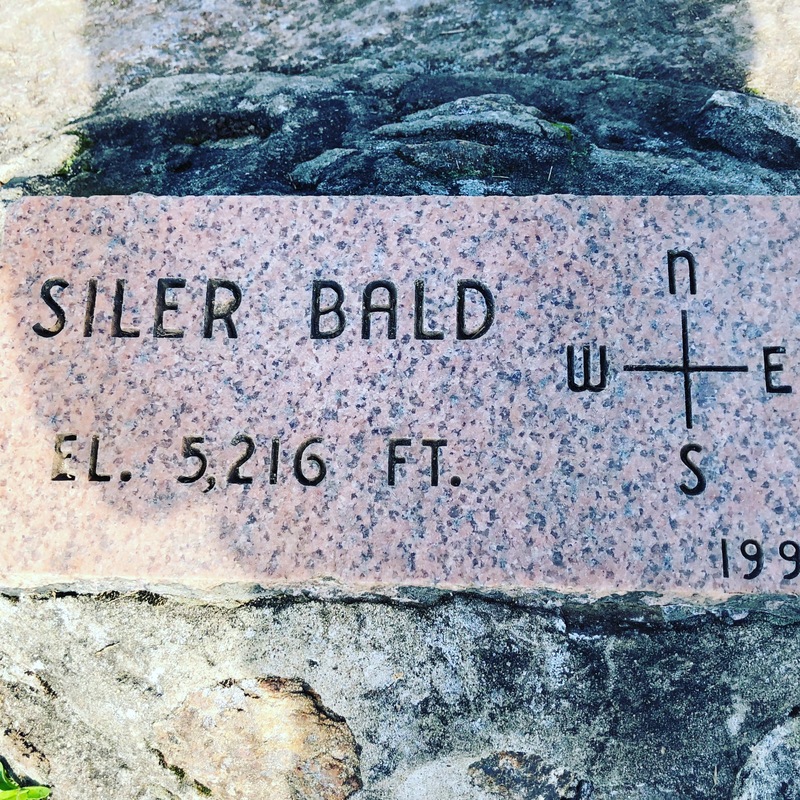 These balds hit elevations over 5,000 ft, and Siler was no exception. 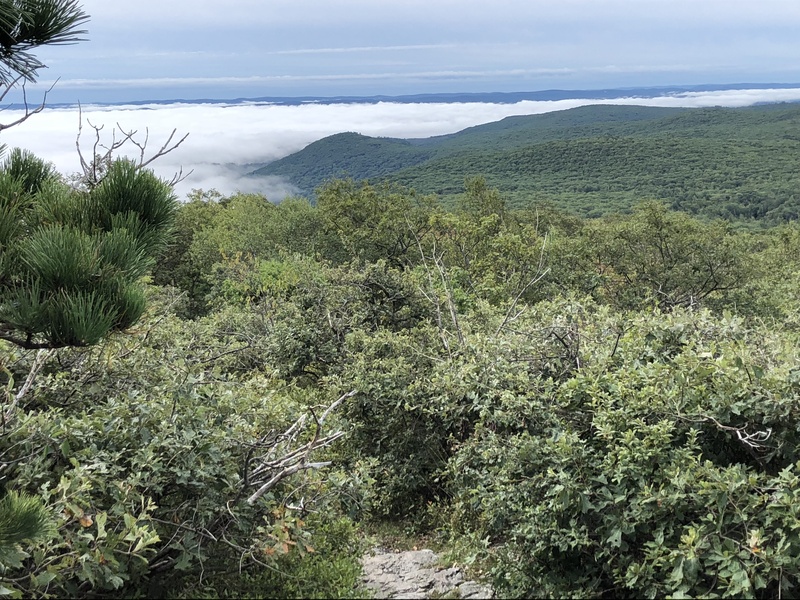 It is 5,216ft and has sweeping 360 degree views including Wine Spring Bald and Wayah Bald (you can drive up to the fire tower up there) directly to the north. We parked at about 4,000ft up at the trail crossing so it was only about a 1,000ft climb, and a very moderate one at that. Jiffy pop led the way, and we brought his new Eno hammock along so he could show us how he sets it up and do a quick 5-minute hang for a rest. 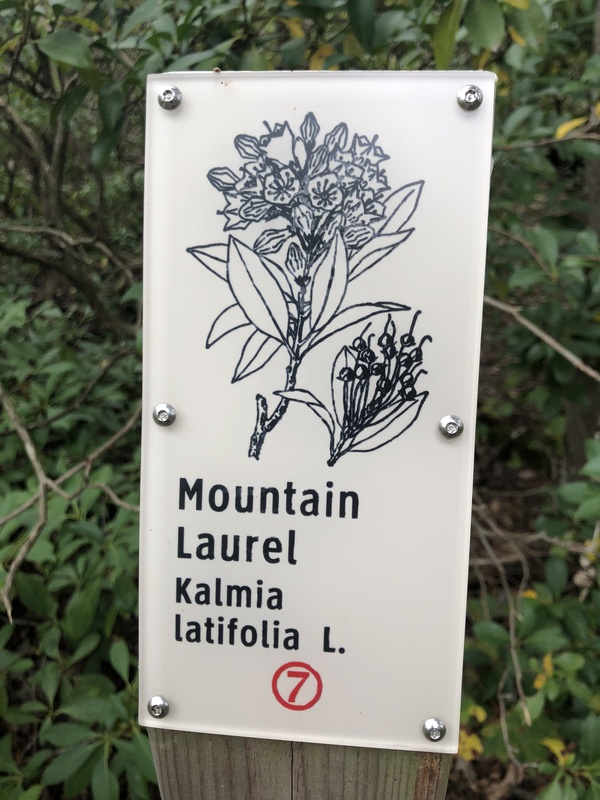 The trail goes through the expected thick Rhododendron forests as it climbs the ridgeline before opening out onto the grassy fields these mountains get their names from. We passed the side trail to the Siler Bald shelter which leads .4 down an old fire road to the shelter site. We did not go down to the shelter because of lack of time. The final climb up the grassy hill to the summit was tougher than it looked but the views continued to open up and it was breathtaking. I did my best Sound of Music twirl and song, but more the Clark Griswold in National Lampoon’s European Vacation version. We filmed a few takes so I got a bit dizzy! A section hiker we met took some photos of us at the summit and then we headed back down. Fielden Stream and I had wanted to spend the night here on this visit and while we didn’t get to do that, I am beyond thrilled we managed to get up there either way. Especially since Jiffy Pop came too. 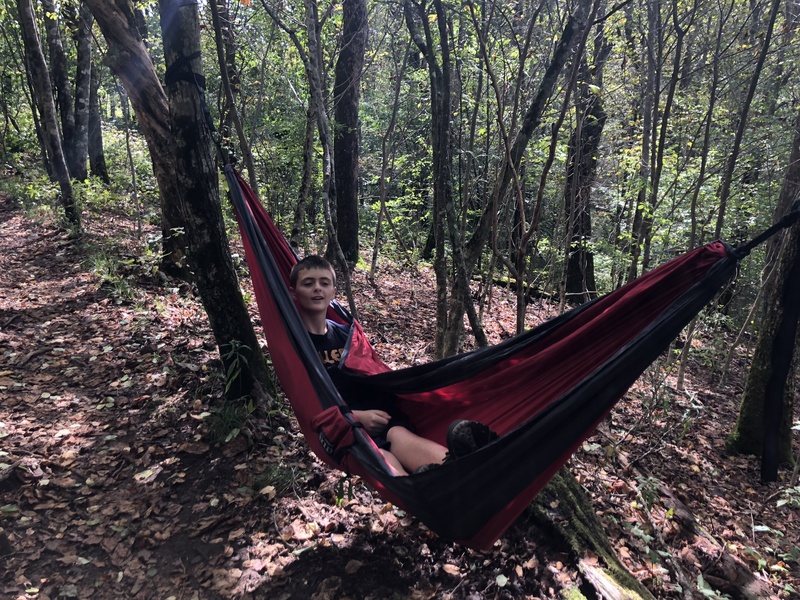 He hung his hammock in the tree line for a few minutes and we all took turns taking a rest in it and having a snack before we walked back down to the car. 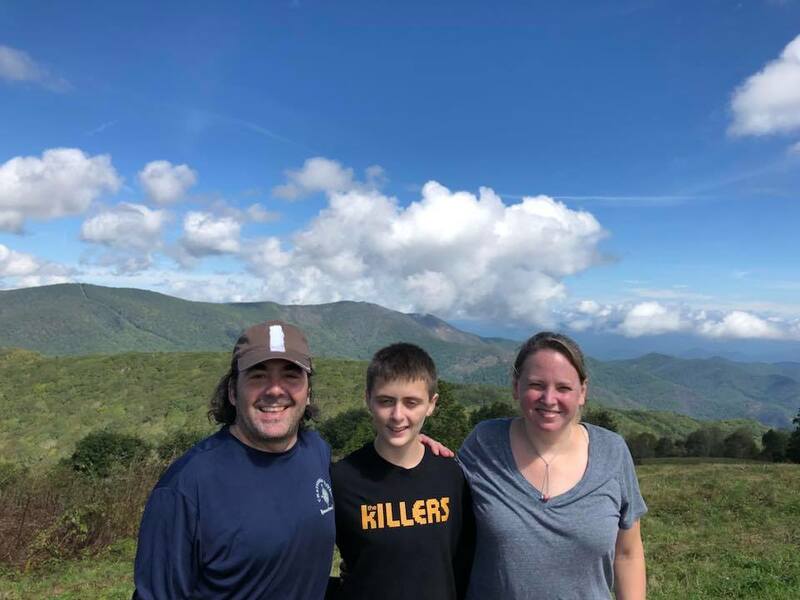 While it will be a while before we can get down there again, it was a great first foray for us all on the southern Appalachian Trail. Hopefully when we come back to visit in late spring we can get in an overnight. 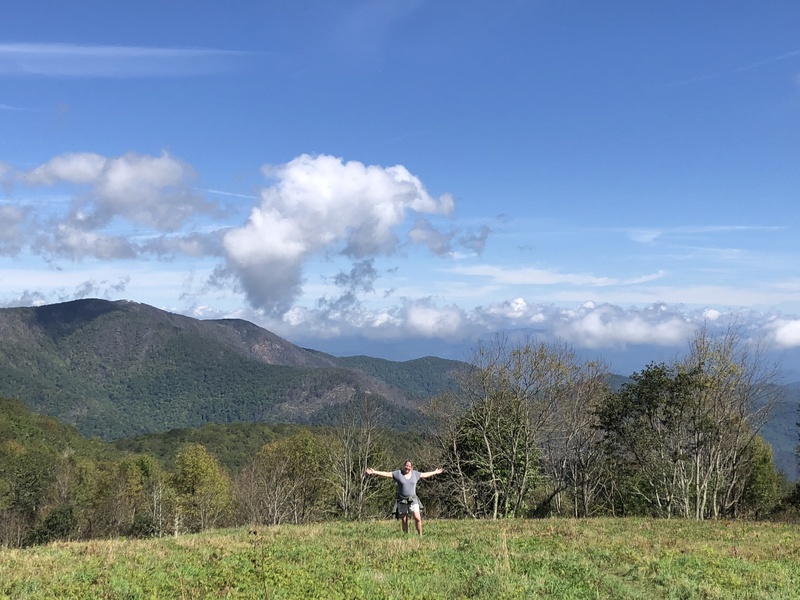 While we weren’t officially in the Great Smoky Mountain National Park, it was a real treat hiking in the Smokies for the first time. My latest ridgerunner weekend was over the weekend of Sept 22nd. I went back to cover a favorite section, the Riga Plateau. It was an amazing weekend but turned out a bit differently than planned. 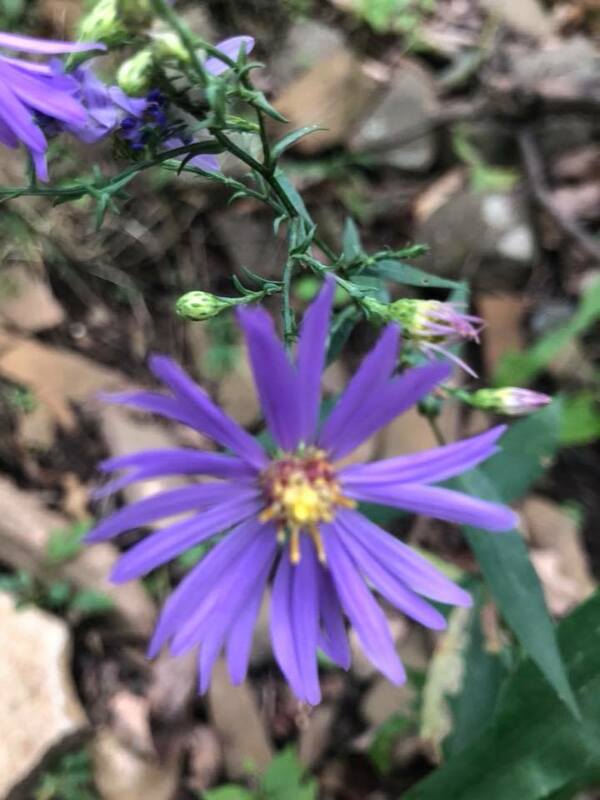 I invited my brother along as he was free and we wanted to do another hike together. I told him all about the amazing views up here, so he was willing to do the almost two-hour drive, like mine, to Salisbury. The weather couldn’t have been better for it. I originally planned to leave my car at the Undermountain trail and then drive up to the Lion’s head trail lot in his car, so I could take him up to Lion’s head and Riga shelter and back to his car easily. And then I’d also have my car setup closer to where I was camping for the night. Well actually it was about the same distance, but this would allow me to go farther north and still make it back to my car when I needed to and not cover the same ground over and over. When we got to Salisbury things changed a bit. Because it was family hiking day, and this being the most popular hiking trail in the state, that lot was a madhouse and there was only road parking available. While I have the necessary signage to probably not get towed If I parked overnight there, I don’t like to take advantage and so I left my car at the main A.T. lot 3 miles south in town on Rt 41 which was also beginning to fill up quickly. No problem, done the hike this way many times. We headed up to the Lion’s Head lot on Bunker Hill road and got the last spot there. 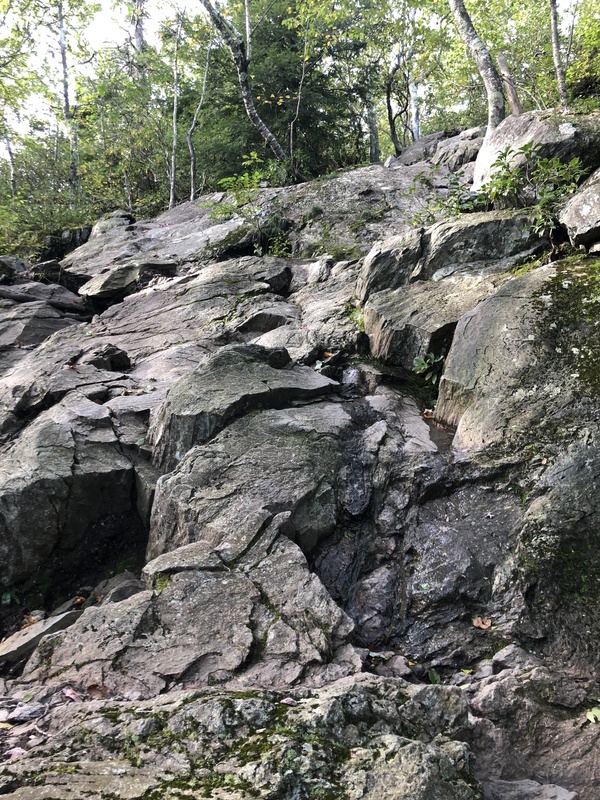 This trail passes a few homes before a brisk climb up to where it joins the A.T. From here it gets a bit more rugged in typical A.T. fashion, and then it’s a steep scramble up a rock face to the first viewpoint. There is a bad weather trail, and this was much appreciated when I recommended it to a group of older ladies from our own AMC chapter who were doing a hike up there this morning. My brother and I took in the views while I also pointed out a few landmarks to a section hiker we met there. 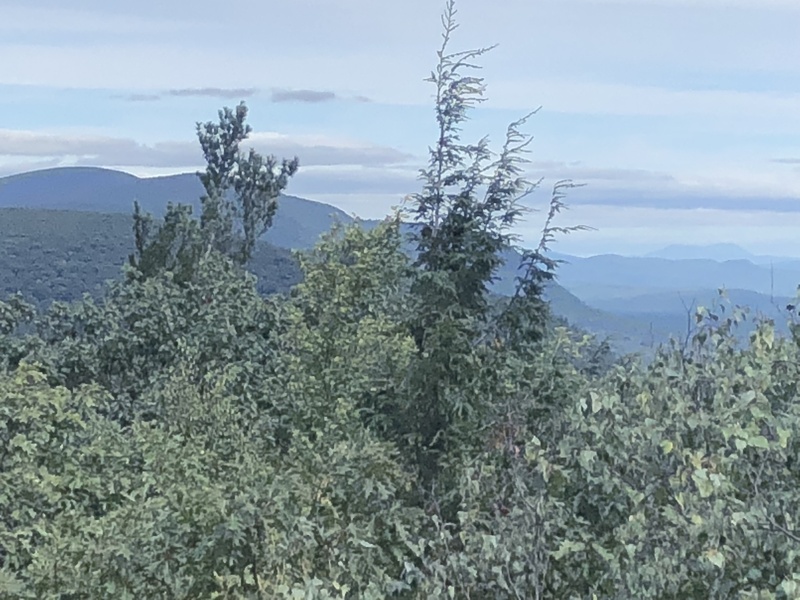 We then took in the glorious northern view which on this day included Mt Greylock, 50-plus miles north in Massachusetts near the Vermont border! We proceeded to Riga shelter and had a snack while also taking in the fabulous view there. Luckily the shelter and campsite were clean, and the brook was raging from recent rain. This was all good because I planned to stay here for the night. Perhaps even in a shelter for the first time! I know, I know. I’m just not a fan of bugs and mice, and my tent protects me from both. From there as promised I took him back to the junction of the A.T. and Lion’s head trail. As I hadn’t taken the bad weather trail before we went down that way, and I knew I’d be doing the scramble on the way back anyway. We got back to the junction quickly and said goodbyes. I took a quick snack break before heading on my way back to Riga to set up camp. On the way I met a few section hikers and a flip-flop thru hiker on Lion’s head. The thru asked about the next camping or town options and then told me the caretakers tent at Sages Ravine was blown far off the platform and almost off the hill entirely. We’ve had some recent large storms in this area lately. I called my supervisors and asked if they were going to be there for the night or if I should stay there instead. As phone coverage in some trail areas is spotty I knew it could take a while so I went to Riga to wait for a response. I took out my notebook to update my notes and have another snack. When word finally came in to head to Sages, I took off in a hurry, leaving my notebook behind! By the time I realized I was 2 miles north and had 2 to go. 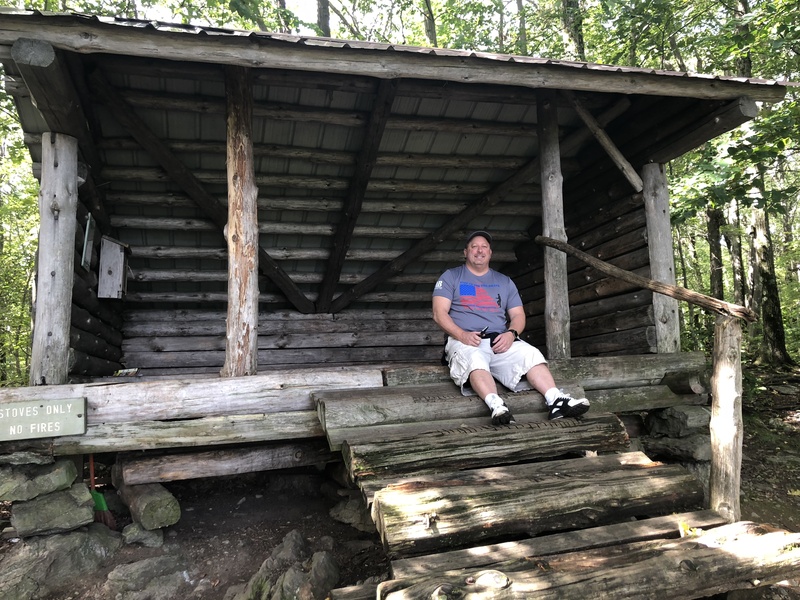 I opted to take the Bear Mountain road and Bog trail past the Northwest cabin so I could get there in time to assess and repair the damage if possible. The Bear mountain road was completely flooded in several areas and I had to do some tricky negotiating around long deep puddles of trail. 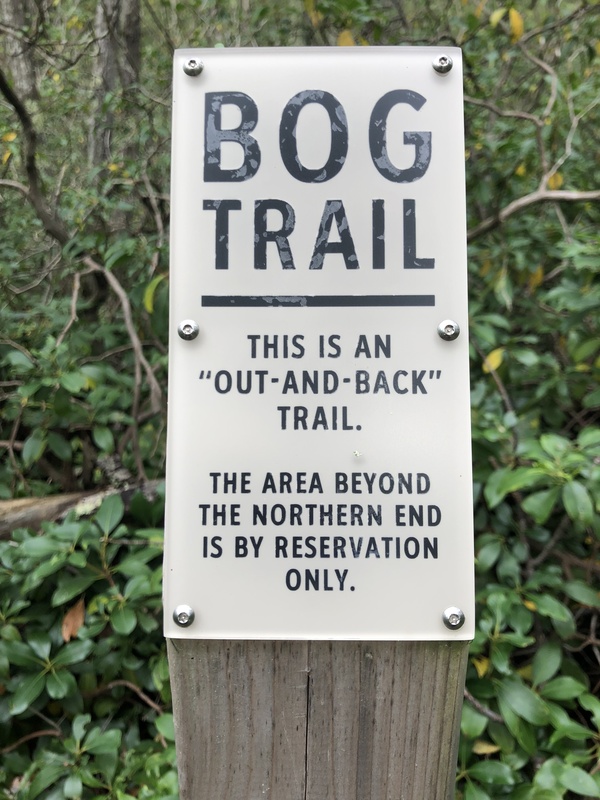 But it was nice to finally see the bog trail with its nature-center style signage identifying trees and plants and natural features, as well as the cabin up close. That’s a reservation-only property, and I have never seen it so up close and personal. There was at least one family tenting there so I got on my way quickly past it. The northwest road was also quite flooded but I made it quickly down to the campsite, covering the 4 miles from Riga in 1.5 hours! To be fair, this was mostly level trail and I went this way for a reason. The caretaker tent in disarray! When I got there, the tent condition was quite accurate. It was off on the side of the hill, scrunched up, with the contents tossed about inside. It had a few tears, and was full of water. Unfortunately this also meant the caretaker journal and many of the books were soaked through. I managed to get the tent and its contents back on the platform and stake it down until it could be packed up by the supervisors the following week. 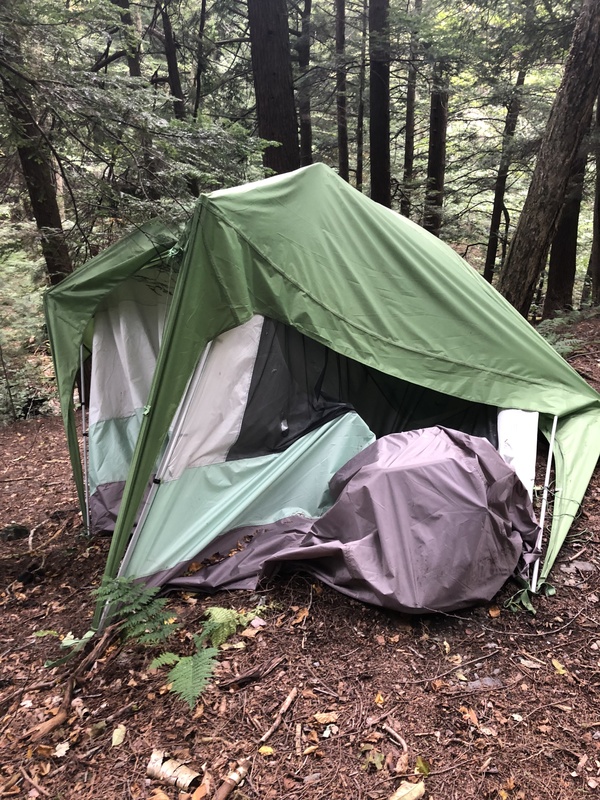 I set out the contents to dry, especially the books and journal, and used a tarp that was dry to set up my sleeping bag on on the drier side of the tent. I had gotten most of the water out but it was still pooling on one side due to a very slight downhill slant of the platform. At this point many people were coming in, some that I knew would be from meeting them earlier in the day. One scout troop was already there when I arrived. When all was said and done we had almost 30 at the campsite. It’s a very popular one due to its beauty. So it’s a good thing I ended up here as only 4 ended up spending the night at Riga (I found out the next day). It was a beautiful night at the campsite and I had nice conversations with several of the hiking groups and helped late arrivals find their party’s campsites as dark was setting in. I fell asleep to the sound of the rushing brook. It got down to the mid 40s so it was a little cool but otherwise no complaints. Morning in the ravine was a beautiful fairy tale forest as always, with the sun shining through the trees onto the shimmering brook. I packed up and after a quick meal of a protein bar (skipped the coffee) I went for the big strenuous climb up the rocky north side of Bear mtn. While I was quite cold at camp, by the time I reached the summit a mile later I was sweating and removing layers. I met several hikers at the top and took in the view from the summit tower. 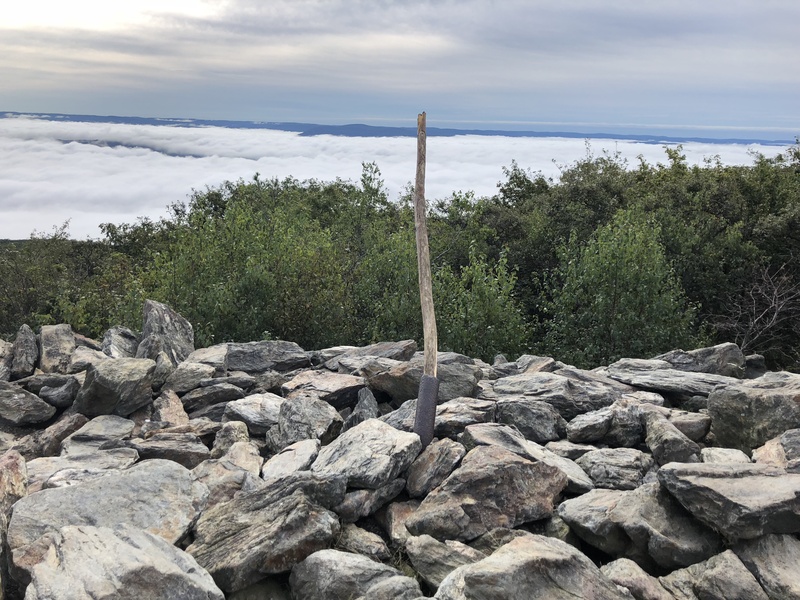 I was above the clouds at this time, so the summits of Mts Race, Everett and Greylock in Massachusetts to the north, as well as Mts Prospect and Canaan Mt to the southeast in Connecticut, were all peaking above the clouds. It was magical. As I headed south, the peak of Lion’s head was doing the same. 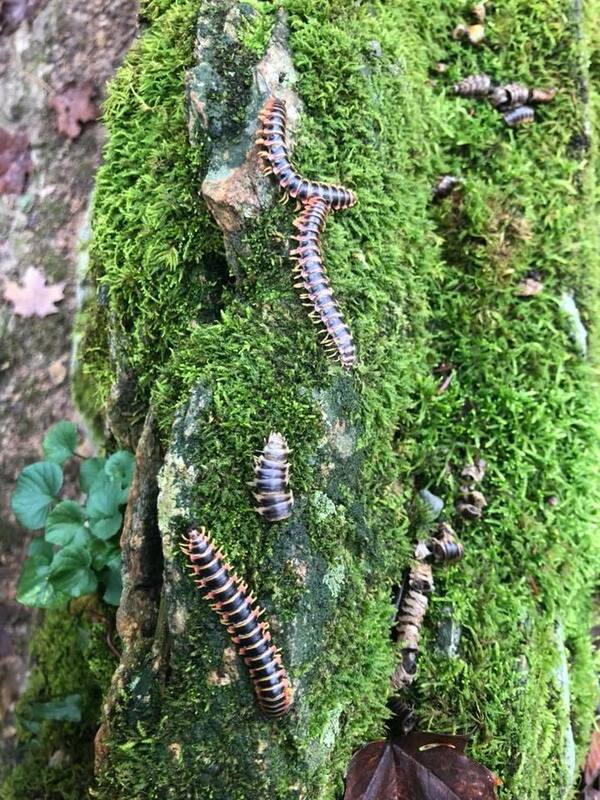 I ran into the section hikers from yesterday and said a quick hello. I pointed out to them where we met the day before on Lion’s Head and then made a dash for Riga, hoping to recover my notebook. As I passed Brassie Brook shelter, I stopped into sign the register and packed out some trash left behind by hikers. As I approached Riga I passed a group of 2 kids and 2 moms who mentioned they had stayed there when we stopped to chat. I asked them about the notebook and they had found it and left it in the shelter for me! They thanked me for my work and I headed back to Riga to pick it up. 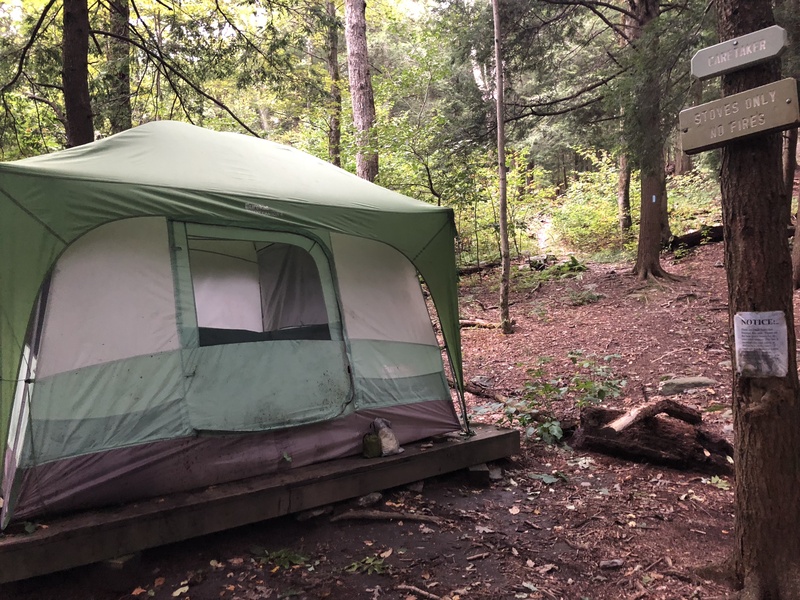 They also reported that the shelter and campsite were clean and campfire-free which I appreciated and confirmed. I had one more snack with the famous view and headed back south towards Salisbury. I met a few more hikers along the way, both section and day hikers, enjoying another gorgeous day on the first weekend of fall. The leaves weren’t really changing yet but will be any day. The last few miles down to Rt 41 via the A.T. pass through some beautiful forest areas, with as many ups as downs. This bit I’ve decided is as much effort in either direction! I passed a few more backpackers struggling up the long climb from the road to Lion’s Head, and when I arrived at the parking lot I ran into one of the groups that were at Sages Ravine with me the night previous. We had a nice conversation and then I headed home, stopping at the hot dog stand in Kent for some nourishment! It’s always a pleasure to hike the wild corner of Connecticut.